Hi! Happy Tuesday. Hope you all had a wonderful weekend. It never seems to be long enough though! Here are some of the snaps I got from that day. Happy Monday! I hope everyone had a great weekend, weather was beautiful here in NY, we even got to go swimming in our friends pool! I know I mentioned I would start posting about my trip and of course life has been a bit hectic since returning. Finally just uploaded some of the 2000+ pictures we took on our camera. Still working on editing them and sorting through the better ones. I thought I would share some that I have from my iPhone as well as include some outfit details! Copenhagen will always hold a special place in our hearts. My husbands mother, Birgit, was from Denmark and raised right outside of Copenhagen. She met my father-in-law and moved to the states where they then raised my husband and his brother. Since Birgit’s entire family was still in Denmark they made yearly visits with the kids while they were growing up. My husband was very lucky to have the experiences he did while in Denmark. Since he had been going there pretty much every summer he was able to make such a great network of friends as well. We would like to continue the tradition of bringing our future children there and giving them similar experiences to what Thomas had. My brother-in-law, Adam, made his way to Denmark 4 years ago to join the Danish Army. This was our 2nd time visiting since he has made the move, and of course he was back a number of times to the states as well over those 4 years. Family means the world to me. I think that growing up and sharing experiences with loved ones is important and what life is all about. Thomas has no family in the states anymore. His mother and father have both passed away and his brother is now living in Denmark, for what looks like the rest of his life, if not for a number of years still. I have the privileged of being able to see my parents and close relatives by planning a weekend to drive home. For Thomas is it a long plane ride away. We plan on making Denmark an every other year vacation to keep a close connection with his family. It is just as important to me as it is to him. So with that said, this part of our trip was amazing! I have been to Copenhagen a couple of times now, both times before were in the winter. Now, don’t get me wrong, Copenhagen is gorgeous in the winter, but man was it cold. I didn’t mind it too much since they don’t get the intense amounts of snow like we do in New York, but it does get pretty chilly. The last time we went before this trip was during Christmas. It was such a fun experience to see all the traditions and being able to spend quality family time. This time was just so different. We were in Denmark for a total of 14 days. We got to stay with Adam as well as Thomas’ cousin, Christian, and his family. Since Thomas and Adam spent most of their time in Denmark in the summers I would always hear about how amazing Danish summers were. It was never too hot, but warm enough to make a few dips in the water. I was excited to finally get a chance to experience the Denmark that Thomas knew so well. With it being warmer out and sunny we got to see and do so much. We even got to go to the bathing bridge near his grandmothers house to swim. The same bathing house that they would swim at all summer long. Here are just a few pictures from Copenhagen. I plan on writing a few more entries on Copenhagen since we saw and did so many great things. I feel one entry would not do it justice. Inside of the shopping center, Magasin, they have this in the basement. It was soo yummy! I got back on Sunday from our AMAZING Euro trip! I am SO SO excited to share it with all of you 🙂 We traveled to Copenhagen, Rome, Positano, Capri, Pompeii, Naples and parts of Iceland. Each part of the trip was amazing in its own way and such an adventure. In Copenhagen we have my husbands entire family, including his brother. So we were busy getting together with family and friends but we had a solid 14 days there so getting to spend quality time with everyone was totally doable. We did lots of family dinners, exploring areas that my husband would spend his summers at growing up (and making so many memories!) and yes, we did good old Tivoli. Each and every time we have visited we have gone to Tivoli Gardens (one of the oldest amusement parks in the world). It is such a fun family tradition. I think it has continued on mainly because Thomas’ cousin, Christian, has two girls (11 and 15 years old) who absolutely still love going. When Thomas and his brother were younger his older cousin, Christian, would be the one to bring them each year as well. I think its so nice that we have continued the tradition and go back each time we visit, and the hopes will be it never stops since we would like to do the same with our future kiddies. It is such a beautiful park, with lots of Scandinavian charm. Then we always eat dinner at a place called Grafton, again its the only place we usually grab dinner at. It was funny actually, since I am a vegan (and Danes LOVE their meat and fish) the menu had zero things on it for me to eat haha. SO we asked them if they have a vegetarian option that could be made vegan and I got a look like, “oh no, one of these weirdos!” It was so funny actually, but they did deliver and they gave me this lentils and veggies type dish which was actually not too bad. We ate dinner this night at the top of the Tivoli hotel )amazing views!) at a place called Sticks and Sushi. Poor hubby was taking the pic otherwise he would be in it too haha. This is my bro-in-law, Adam, and his gf, Signe. Then after 12 days in Copenhagen we flew to Rome where we did one night, then drove (yes, we drove in Italy and yes it was one of the craziest things I have experienced lol) to Praiano, where we stayed for 3 nights. Then drove back to Rome and spent the night and took off early the following morning. It was actually great having a car and being able to stop off where ever we wanted to and to be on our own schedule. Rome was amazing. I know it is touristy but for all the right reasons. I have never with my own two eyes seen such amazing history all over the city. It is a giant metro city and as you walk down the street you pass structures that are 2,000+ years old! It was just so magical to see all of it. We did get a chance to do a guided tour of the Colossuem and Pantheon (which I highly recommend!) It was great having a guide show us around and point out things and explain them to us. Way better then if we walked around on our own, at least that was my personal opinion on it. Our tour guide was also an archaeologist so she was super knowledgeable and really painted a great picture for us about the history of Rome. Then from Rome, our most relaxing part of the trip, Praiano/Amalfi Coast. As I referenced above regarding the driving, I mainly am referring to the crazy roads you have to take to get to the Amalfi coast. I have never seen such narrow (2 way) roads that wind and turn like crazy all along the edge of a cliff….It was just unbelievable how they drive and how good they are at it! haha Then on our way back to Rome we stopped off in Pompeii (another crazy awesome piece of history to explore) and Naples. The Naples stop was literally just for pizza. We weren’t going to drive past the birth place of pizza and NOT get some to try. So we made a special pit stop in Naples at a place called, Del Presidente, to grab pies. OMG, it was everything I hoped and dreamed it would be haha. This is just a little sneak peak of some of the pictures. I literally took thousands! Haven’t even uploaded them all from my camera. These are all just my iPhone pictures. Running sushi-you can see the conveyor belt in the back! We asked them if more veggie/vegan sushi would make its way to the belt and they were so sweet and made this up especially for me! So after our 2 nights in Copenhagen we then flew out and did a 3 night layover in Iceland. We stayed in a hostel (with a private room and bath) in the heart of downtown Reyk. The beauty in that country is unreal. The nature it like no other place I have seen. The best way to describe how it looks is pretty much something from another planet. The rocks, glaciers, moss, waterfalls, all just so insanely beautiful. We also did the Blue Lagoon (you cannot visit Iceland and NOT go there-and yes, it lived up to its expectations). We rented a car here, which again was an awesome idea. No need to get on a big bus with strangers and go around, we were on our own time and it was perfect. Again, this is just a sneak peak of some of the wonders we saw. I have been brainstorming how I would like to present the trip here, on my blog, and I am going to post about it according to my journal. I kept a travel journal the entire time. I just hate forgetting each day, especially when you are traveling around for so long, so its a nice way to re-live each day when you read the entry. This way I can break down the trip in a better order. I am looking forward to sharing everything with you guys and will hopefully get the first post up and edited this weekend! This is going to be a number of entries but I feel like its the only way to capture most of it AND show off some of my outfits and give all the details! Any fun travels that you have coming up?! ***All these pictures are my own. Please do not use them without my permission. So a few days ago I posted that I was going to try the Jus by Julie cleanse, I did and want to talk about it. I started my 3 day cleanse on Saturday (7/9) and I officially ended it yesterday. I have to say I am rather impressed. Going in I really thought I was going to be starving the entire time, getting headaches and all the things you hear people talk about when they try a cleanse. Well, I experienced none of that actually. I was completely full and satisfied after each drink. Some may know this but I am a vegan. Not sure if its just because I really love veggies or what but I thought the drinks tasted amazing! I would actually crave my next juice each day. I read some reviews where some people said one of the drinks was “too green” for their taste but I didn’t feel that way at all. Each drink is numbered 1-6 (you drink 6 a day) and I drank them about every 3 hours or when I started to feel hungry again. My husband did not do this cleanse so by the end of the day when he was eating dinner in front of me, I did get an urge to “chew” something. Its funny, in the information they give you they do mention that if you feel the urge to “chew” then you can eat 2 cups of raw or steamed veggies. So I did eat a corn on the cobb. This was not because I was hungry (I really wasn’t at all actually) I just really was craving the corn to chew on, I know it sounds odd but I don’t know how else to explain it haha. Day 1: felt great all day, loved the taste of all the juices, the #4 I drank was the PB and J and it was divine! (strawberry, bananna, all natural PB and rice milk) One of my faves. I also really enjoyed the spicy pomegranate. And I did eat an ear of corn. Day 3: last day. At this point I was actually looking forward to getting up and having my first drink of the day. I didn’t think I had it in me to really go that long without “eating” solid foods but I was feeling great the entire time and never once felt like I was depriving myself of anything. I did have some cauliflower and raw Kale to get my “chew” fix LOL. Overall: I would totally do this cleanse again. I loved that it was so easy, everything is numbered for you, pre-made etc. All I had to do was drink them across the entire day which was never an issue. It was nice that they had a few different flavors that they mixed into each day. The #1 juice and #6 were always the same and the others rotated. My bloating has gone down so much. I feel like I hold a lot of my stress in my stomach and I feel bloated often, I felt like that had gone down considerably. I did take some before and after pics for my own record and you can definitely see a difference from day 1 until this morning when I took the final picture. Price: They seem to have promos running all the time. When I purchased my cleanse it was $30 off, free shipping and 12 free booster shots. This all came to $120. That is a decent amount of money to spend on juice but I think its much more reasonable then others I have seen. They have coupon codes all the time, I just looked on their site and they have the same promo running that I got with promo code JUICENOW. Ordering: It was a breeze. You pick a date you want the cleanse to be delivered. I chose Friday (since I knew I wanted to start it over the weekend) and it arrived when they said it would. Since the juices are fresh they are perishable. So they send them frozen and packaged up in such a great way to assure they will not go bad on their way to you. I was really impressed. A close up so you can see what the ingredients are. This one was so tasty ! **All of these are my own opinions and Jus by Julie has not sponsored this post. I will be highly recommending this cleanse to anyone looking to try one. Comment below if you have tried this and what your thoughts were or if you do end up trying it let me know! Soo happy its finally Friday! Even though we had off on Monday this week just couldn’t go by fast enough. I am prepping all weekend long to get ready for our trip next weekend!! Its finally here, I cannot believe how quick that came up on us. So in preparation for this trip, aside from the usual gel mani/pedi, lash extensions etc., I am doing a juice cleanse this weekend! I came across Jus by Julie while doing some research and they were having a sale on their 3 day cleanse so I decided “what better time then right before my trip to try this!” I am very excited to start the cleanse tomorrow. I just thought I would talk a little bit about what I am expecting from this as well as what they say they are offering and then I will do a follow up post next week on if I liked it/didn’t like it and if I lost any weight etc. So this is a 3 day juice cleanse. That’s right, no solid food for 3 full days, bring it on! They had a promotion where you can get the 3 day cleanse plus 12 booster shots for free AND $30 off AND free shipping. It came to $120 which I thought was rather reasonable for 3 full days of “food” also with the hopes of shedding some weight. They give you 18 juices total and you are supposed to drink 6 a day. They say to drink them about every 3 hours or when you are starting to feel hungry. They come labeled so you know which one to drink 1st, 2nd etc. on each day. They also said the juices will last in the freezer up to 2 weeks if you decide to not start the cleanse immediately. I thought doing it over the weekend would be so much easier then trying to bring 4/5 juices with me to work. So I just have to bring them with me on Monday since I will start tomorrow. I read a lot of reviews (most were very positive) which intrigued me even more to try this out. A lot reviews said they were surprisingly not hungry during it, they had a lot of energy and dropped a few pounds. My hope is that I will be able to lose a couple of pounds, de-bloat a little and just overall detox myself. After last weekend (4th of July) I feel like a detox is a good thing lol. 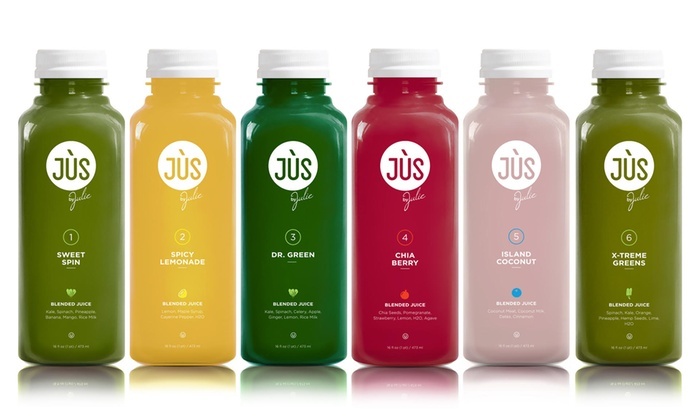 Jus by Julie has promos a lot on their site, the 3 day cleanse + 12 free booster shots and $30 off + free shipping (that I just purchased) is still going on with promo code JUICENOW. If you get their emails they send you promotions as well which is nice if you choose to do it again and do not want to pay full price. Any one out there try this cleanse?? Thoughts on it, love it? hate it? results? Would love to hear!